-- Select a Size -- Petite Petite / Small Small Small / Medium Medium - Out of Stock! Medium / Large Large X-Large - Out of Stock! The PetSafe Gentle Leader Easy Walk Harness in Black and Silver is designed to gently discourage dogs from pulling while walking on a leash. Quick-snap buckle on both the shoulder and belly straps for easy on and off. Belly strap is an attractive complementary color - making it easy to identify which straps go where. Traditional harnesses can actually encourage dogs to pull harder on a leash because of the "opposition reflex." 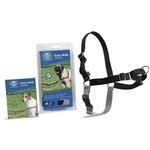 The Easy Walk Dog Harness' unique front-chest leash attachment stops pulling by tightening slightly across your dog's chest and shoulder blades. The gentle pressure steers your dog to the side and redirects his attention back towards you. 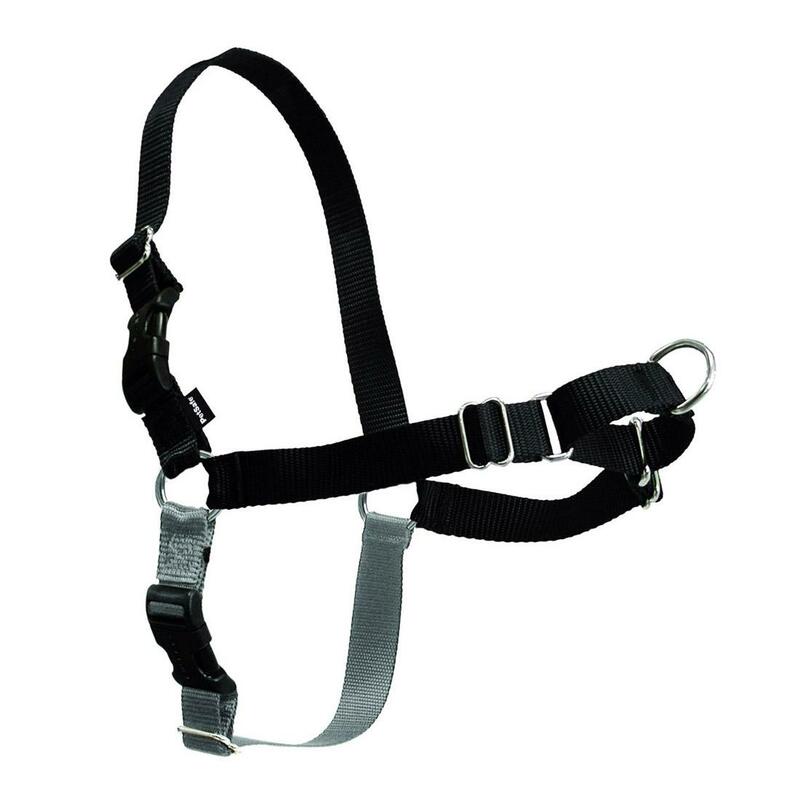 The Easy Walk Harness never causes coughing, gagging, or choking because the chest strap rests low across the breastbone, not on the delicate tracheal area. Great for any dog, big or small! Girth/Chest should be measured snugly around dog's rib cage, just behind the front legs. Chest width measures across the front of the chest to the intersection of the girth measurement. See the measuring chart for detailed measuring instructions. 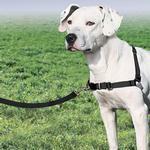 Easy Walk Nylon Harness by PetSafe - Black/Silver Customer Photos - Send us your photo! The sunshine in my life. Love you Stanley! Posted On 03/07/16 by Ellen R from Southington, CT Yes, Ellen R recommends this product! My 15 lb Yorkie/Doxie mix is a real puller...choking himself along the way. A regular harness saved his throat, but then he pulled even more, because it didn't bother him to pull! 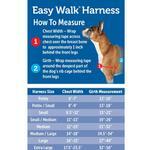 The 'Easy Walk Harness' is just that...an EASY WALK! The leash clips on at the front of the chest, so when the dog pulls, it redirects him/her to turn. Pulling then defeats its' purpose. On this harness Toby walks like a little gentleman! This is his second Easy Walker (a spare) He wears it 24/7 and it still works like a charm! This is not a substitute for obedience training, but it meets my needs and is easy to put on once you figure it out. It does not rub like some harnesses do on the dog. I have more than one for each of my dogs.